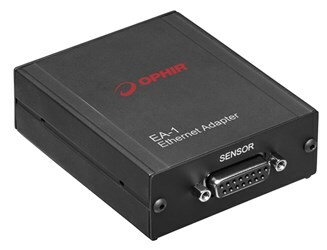 San Francisco, CA – Ophir Photonics Group, a Newport Corporation company celebrating 40 years of excellence as the global leader in precision laser measurement equipment, today at SPIE Photonics West 2016 announced the EA-1 Ethernet Adapter, a device that connects Ophir's smart laser sensors directly to an Ethernet bus, no PC connection required. The EA-1 is designed for OEMs who need Ethernet connectivity and want to control the sensor via their own custom software. The adapter can be used with virtually any Ophir thermopile or photodiode laser sensor. Sensors can be monitored remotely over the Ethernet bus, allowing connections from distances far in excess of those supported by RS232 or USB. To get users up and running quickly, the EA-1 Adapter supports Telnet and HTTP protocols. Installation and choice of an IP address are simplified via the PC application supplied with the adapter. The software allows setup and basic functionality, such as monitoring power and changing measurement scales. A wide range of smart sensors from Ophir are supported. Each sensor stores all configuration and calibration information in its smart plug; when the sensor is plugged into the adapter, the correct power and energy are measured and displayed. The photodiode sensors measure low laser powers, from picowatts to hundreds of milliwatts and as high as 3W. The thermal sensors measure from fractions of a milliwatt up to tens of thousands of watts. One example is the recently introduced 3A-PF-12, an ultra-sensitive sensor that measures powers from as low as 15µW up to 3W and energies from as low as 20µJ to 2J. The EA-1 Adapter also provides measurement of single shot energy at pulse rates not exceeding one pulse every ~5s, when working with thermal sensors that support this feature. The EA-1 Ethernet Adapter can be powered directly from the Ethernet bus if Power Over Ethernet (POE) is available, or from a standard Ophir 12V power supply. The adapter supports power input up to 24V DC, if available. The EA-1 Ethernet Adapter is available now. OEM pricing is available on request.